“The boundaries which divide life from death are at best shadowy and vague. Who shall say where the one ends, and where the other begins?" The very essence of the human soul and spirit are still a mystery to the scientific world. What is the human spirit? What is the make up of the soul? What is a ghost? We may one day understand what is felt by so many ... but in the mean time all we can do is try to understand it. Anam Paranormal is a professionally operated team out of Topeka, Kansas. We study all the haunted stories and urban legends, finding the facts behind the fiction. Actively seeking out all the ghosts in the area for public display of investigation, you can find us anywhere from private homes to graveyards. Is there a ghost, an entity, a haunting, many hauntings, an urban legend? If there is a mystery to follow we will find. ​If you've come to see ghost pictures, full figure apparitions, mists and orbs then you've come to the right place. EVP, we got that! 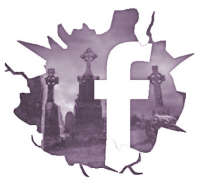 Welcome to our site, and feel free to go through all our investigations of haunted locations. All evidence is posted, haunted or not, so feel free to follow the navigation above. Run by paranormal veteran Drea Penndragon - Topeka, Kansas and surrounding areas and states.